Champagne, smoked salmon and scrambled eggs at the Caviar House at Gatwick Airport was perfect way to start the Barbados trip. It is a long flight, close to 9 hours, but flying on BA means all the drinks are free, so we managed to drink back a good portion of the fair. I tried to watch 12 Years a Slave on the terrible entertainment system, but managed about 12 days of the story before giving up. Sobering up at Grantley Adams airport in Bridgetown, we went in search of Roosevelt, from Honeybee car hire. Anyone who has ever been to the Caribbean will know that time keeping and order are not their strong points. Who was it, for instance, who decreed that all the UK flights and the flights from the US should arrive at almost the same moment. It is wonderful chaos however, but you have to learn to adopt a laid back mañana approach, as it all comes together in the end. Some of us are able to deal with it, others not so easily. That is all I am saying on pain of death. Eventually, in the melee, we found Roosevelt, our car hire man and after an interminable amount of form filling, got into the little car and headed out across the island to Bathsheba, on the windy Eastern side of this lovely island. Our destination was The Round House, a bar, restaurant and hotel in this wild windswept eastern surfing paradise. I have to say it is one of the most breath-taking coastlines I have ever seen, in fact this is the first picture I took from the hotel. Sitting on the stunning terrace as night fell quickly, we ended up chatting to an American couple from Michigan, whose first visit it was to the island. It seems they have also had a monstrous winter with 4 feet of snow for months. Anyway, after I had explained the benefits to them of opening an account with Currencies Direct, thereby creating grounds to discuss claiming the expenses of the trip as a tax allowable deduction (there is absolutely no chance, but it is good sport to wind him up) we got on to the subject of why we were here, which, is sport (did you see what I did there?). As you will know if you have been paying attention for the past week, the main reason to be in Barbados is for a 50th birthday celebration of Steve “trouble up t’mill” Jackson, the splendid old northern git we met on the Golden Oldies cricket tour to Adelaide in 2012. A fellow cricket nut like myself, he decided that he wanted to celebrate this momentous milestone by watching England play cricket in the West Indies, and was kind enough to invite us to join him. I explained to the charming Americans that there were quite a number of Brits over to watch the cricket and that was when the female half of partnership uttered the immortal words “is that the game with the horse?” It took me a few seconds to realise that she had mistaken cricket for polo. Don’t you just love our stateside cousins? You will have realised that your daily “must read” missive is a little later than usual today, and that theme could continue due to the time difference, unless I can get my act together and write it the night before. 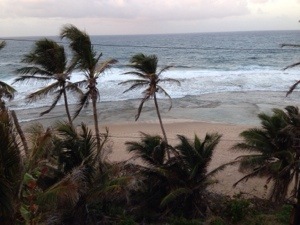 This morning, we shall be exploring the sensational beaches along the Eastern coast, starting with a long walk along the beach, and do you know, we may even pop into one of the rum shacks in Bathsheba to sample some more of the local rum punch, to which we had paid our respects the night before. And later cried. ‘Issy my tum racks’ !! Just the ticket for stuffing up b+m cracks !! O.K. just ignore me everyone..I’ve had a bad day !!!! Hahaha Rev. I liked it !! Thank you Helen. How are you enjoying being home ? It should allow me to concentrate on the limericks a little bit more though …….. Yes you certainly did Helen and it’s going to get even nicer apparently !! Looking forward to those limericks ! !